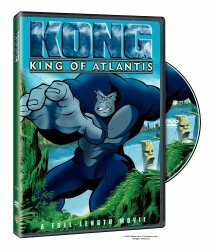 Kong reigns again in this action-filled animated adventure featuring a new, more powerful Kong. The giant ape, reborn from the DNA of the original Kong and DNA from his human ” brother” Jason, rules his island kingdom. But now, in accordance with a prophesy of doom, the ancient civilization of Atlantis has arisen from the sea and its evil Queen Reptilla wants Kong to rule with her, to once again be Kong: King of Atlantis. As Jason and his courageous allies race to thwart Reptilla, they face colossal animal warriors, mysterious tar pits, and noble rebels. Amid non-stop thrills, Jason must attempt to use the special power of cyber-link so he and the ape can merge into one furious fighting hero. Only together can they save Kong Island, and Kong himself! For those who enjoy the American style of animated characters, this full-length state of the art feature will satisfy.